Kristiansand, like so many other Scandinavian towns, was founded by and named after Christian IV. The city is connected to continental Europe by air and sea, with developed shipbuilding and ferry services. 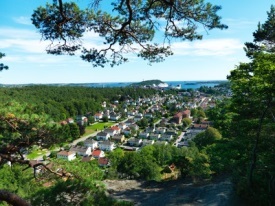 Kristiansand is the capital of the county of Vest-Agder and serves as an important trade center. Popular landmarks and events include Kristiansand Dyrepark (Kristiansand Zoo and Amusement Park), a multi-day music festival known as Quart Festival (each July), and the Agder Theatre.